A B.C. 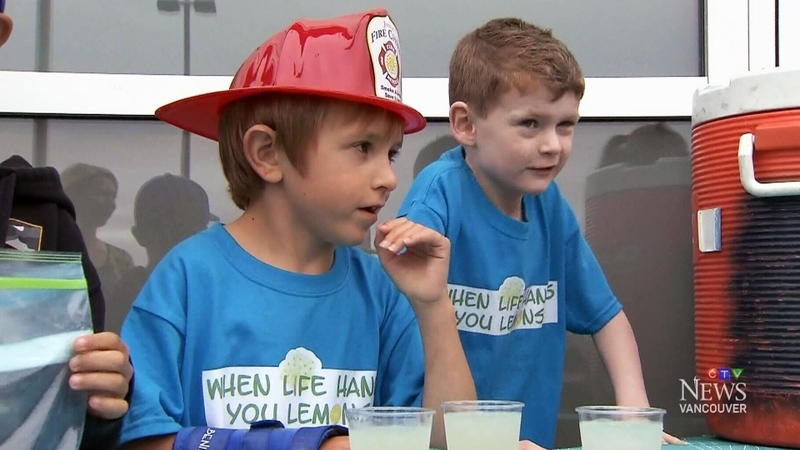 boy opened up a lemonade stand this weekend to help raise funds so that his best friend with cerebral palsy can get an expensive surgery that's not currently available in Canada. The lemonade stand was part of a larger fundraising effort, that’s garnered more than $48,000 in donations. Seven-year-olds Quinn Callander and Brayden Grozdanich have been best buddies since they were kindergarten classmates. "They are such great friends, when Quinn comes into the room, Brayden squeals," Quinn's mom, Heather Roney, told CTV Vancouver. Brayden has cerebral palsy, a disorder that affects movement and muscle tone. Every time Brayden grows, his muscles tighten, and simple activities can become very difficult. Brayden's parents say it's been hard for their son to accept his symptoms. "He gets very frustrated because he'll try to do something, and he'll get mad at himself because he'll fall," Brayden's mom, Toni Grozdanich, said. "Like when he gets tired, he'll trip a lot easier because his legs just sort of drag behind him." There's a procedure Brayden can get in New Jersey that can help alleviate some of his suffering, but it's expensive, costing about $15,000, not including travel expenses and ongoing physiotherapy treatments. Brayden's father, Travis Grozdanich, says the surgery is less invasive than the treatment that's currently available in Canada. Brayden's parents were prepared to take out a loan to help their son, but that's when Quinn stepped in, thinking he might be able to help. "After I watched one of (Brayden's) physiotherapy things, and I saw how hard it was for him, I asked my mommy and daddy if I could build a lemonade stand to raise money," he said. So, together, Quinn and Brayden manned their lemonade stand in Pitt Meadows, B.C., over the weekend. Decked out in matching blue shirts with a slogan reading "When life hands you lemons… make lemonade," the two sold glasses of the sweet stuff to passersby. The pair attracted lots of customers, with many generous residents donating $20 bills to the cause. In addition to the lemonade stand, Quinn's mother has helped create an online fundraising campaign that's already surpassed its $20,000 goal. On the website, Quinn describes Brayden's cerebral palsy and his surgery, which is scheduled for August. "Please help me raise money to help my friend Brayden, he is a really good guy," he writes. By Monday morning, more than $48,000 had been donated on the site. All of this generosity has left Brayden's family at a complete loss for words. "It's just unbelievable," Toni Grozdanich said. And as for Brayden, the small, blonde-haired boy says he's looking forward to his surgery. "It will help me walk better," he said with excitement. Brayden Grozdanich (left) and Quinn Callander (right) sell lemonade in Pitt Meadows, B.C., on Sunday, July 6, 2014.